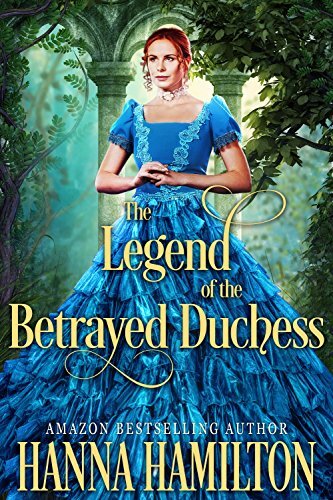 The Legend of the Betrayed Duchess by Hanna Hamilton is a Historical Romance Novel. Lucy Brighton is the only survivor of a terrible house fire that has killed her whole family. At the age of six she has nowhere to go but is lucky enough that the Duke her parents were tenants of takes her in, even with the duchess. The Grayson estate ruled by the Duke, Matthew, his wife the Duchess, Judith and their three daughters and one son. The duchess is not happy of the child remaining with them and treats her more like a servant. Betsy the youngest girl and George the heir both take to Lucy and think of her as a member of the family while the others don’t like her. Lucy starts to learn with George and he realizes that she is extremely smart especially for a six year old. Ten years later as George is now twenty he begins to pursue an art career much to the unhappiness of his mother and father. At the same time, Lucy begins to start writing children’s stories. The two have become closer and each see the other as more than just friends though neither tell each other. George knows that he shouldn’t be interested in Lucy since she is a commoner, but anytime he is introduced to another woman, he can only compare them to her. At the same time the Duchess is trying to marry off her daughters to eligible men. Though it doesn’t seem to be going well. Can the three sisters find true love and will George decide who he can be with? This was an interesting historical novel that has some depth to it. I liked that Lucy was such a nice person, but really let herself get walked all over by Judith. George is a strong male main character that doesn’t put up with anything that could hurt him or Lucy. I liked that he was forceful in his attitude towards him mother and wouldn’t give her the time of day. The writing is good, Hanna did a nice job of creating a household in the English Countryside.